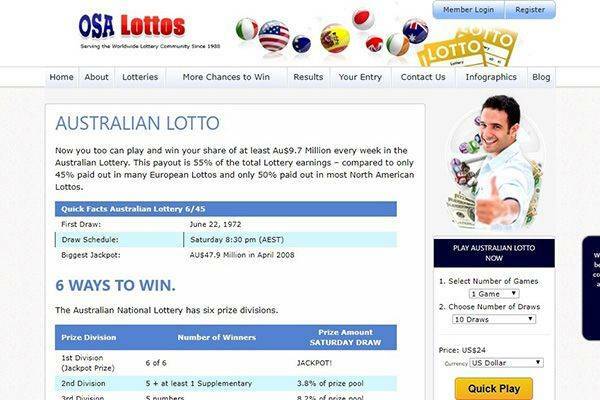 OSA (Overseas Subscribers Agents) launched on 1988 with the goal of servicing lottery players who want to play USA government lotteries but are based overseas to America. 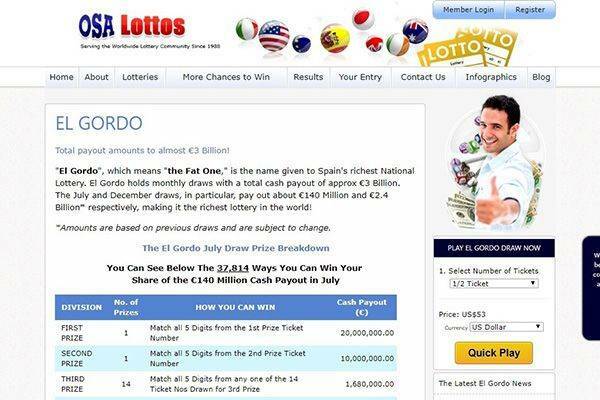 On the website there’s a decent selection of lotteries for players to chose from. They share too much information on fraudulent activities and players disagree on the type of customer services they offer. 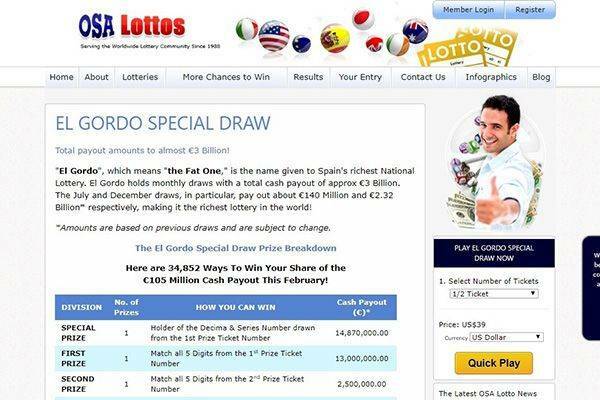 OSA lottery is the channel between players and lottery organizations. They offer players the opportunity to play games that are not available in their country or state. OSA have been at the beck and call of over 155,000 players since 1988. 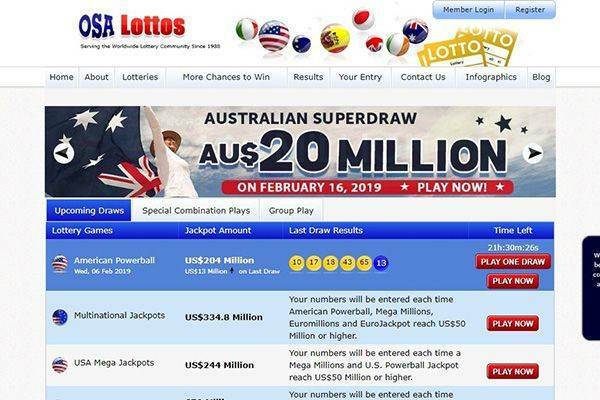 They offer games such as multinational Jackpots, USA mega jackpots, European mega jackpots, American Powerball, Euro millions, Australian lotto Superdraw, UK national lottery, Irish lotto, Supernational draw, Japan jumbo draw and so on. Your entries will be processed so that you will get the first available entry into your game of choice. They will keep you updated on winnings through e-mails and on their website. OSA does all the heavy lifting on your behalf, yours is to make the right selection of numbers and hit that jackpot. Their mobile platform is a fine avenue to get updated on games and play with ease of mind. The site is updated so that you can get information on which of the game will best suit your needs. A section on the site is called “latest news” where you can find up to date information on each game that is on-going. They also give advice to players on which of the game will help them earn more winnings. It is only valid for lottery games purchased with a credit card. It is limited to the first single purchase, with a minimum amount of $24. It is only valid for entries offered by euro millions draw. Cash offers will not be giving for losing entries. If 5 games are purchased and 2 are winning entries while 3 are losing entries, the voucher will only be offered for the 3 games in the euro million draws. A winning entry means games that are won by winning combination will result in a payout for the specific draw entered. Your voucher will be forwarded to your e-mail within a period of 48 hours. Only 5 vouchers can be awarded for this offer. Vouchers offered are only valid for a period of 14 days, starting from the day it was issued. Any foul play detected, the voucher will be cancelled and instantly nullified. The financial institution you used while registering on OSA lotteries is essential for your cash deposit and withdrawals on this platform. You are only permitted to make a deposit for entries through the use of your credit card which must be synchronized to the account bearing your name and other personal details you submitted on the website. Some financial institution places restrictions on using the credit cards on lottery sites if you fall into this situation you are advised to use the manual means of deposit or withdrawal, their customer care representative will place a call to you on how to make deposits without the use of the credit card. You will get a prize notification when you win, stating the amount you have won. For cash prizes above $1,000, One of their customer care representatives will place a call to you asking you for means of withdrawal of your cash prize and you will provide a bank account where you want your cash prize to be remitted. For cash winnings below $100, it will be transferred directly to your bank account. 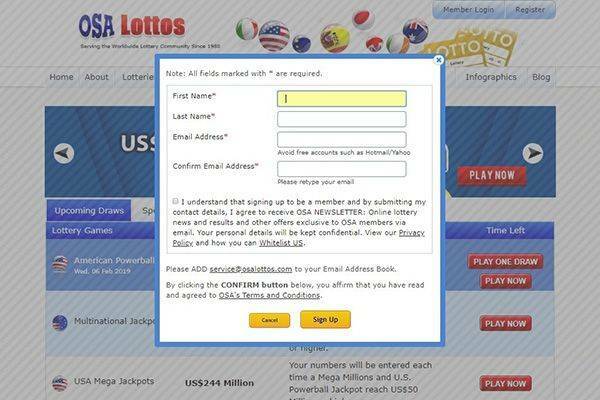 While there’s no FAQ page to let visitors to the site and registered lottery players resolve issues by themselves, there is a lottery guide that gives some valuable and enriching information. Customer support, when a personal troubleshoot is required, is available through a contact form, phone – few locals available – and live chat. In the contact us page working days and hours for customer support services are clearly visible. For some reason, few state the working hours. Is OSA Lottos legit or fraud? The management of the sites have created measures to curb any kind of fraudulent activity on the sites by partnering with Integrated Business Direct Limited situated in Spain, which serves as prove that the website is very legit. They make conscientious effort to verify the true identity of the players. No transaction is allowed under the guise of anonymous or a mischievous name or details. This is to eradicate cases of money laundry and remove fraudsters from OSA lotteries. Reaching out to clients in the most friendly manner, has made OSA lottery one of the most accepted online lottery organization in the world. 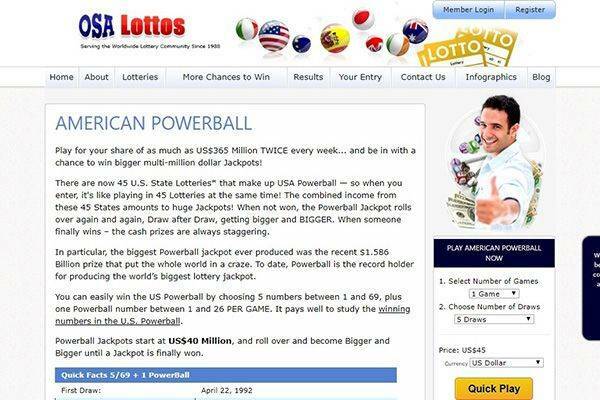 There's a decent selection of popular and high jackpot potential lotteries. Mobile view has a dedicated design that is more friendly for small screen devices. Customer support day and time is clear and visible – something that should be default, but often vague.